Whether you're a student, an office worker, or a homemaker, everyone deserves a well-organized wardrobe space. Not only will it save you from being late for your appointment, class or meeting but it will also allow you to have a proper inventory of your own personal things. In that way, you can properly account for the things that you need to get rid of, things you want to donate or things you want to reinvent. In my case, keeping a well-organized wardrobe allows me to have a peace of mind. I am a person who hates clutter so I always make it a point to arrange my clothes and other personal things neatly. To achieve this, it is very important that you sort out your clothes according to their use. Office clothes must be situated in one row, sports clothes in another and casual clothes must have their own space too. 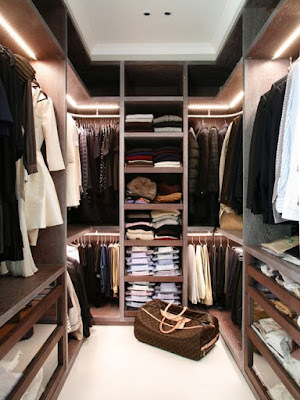 There should also be a designated area in the closet for your party clothes. This way, it won't be difficult for you to get them once you need them. Those that are often use must be placed on the most visible area, probably in the front row. I also take time to fix my husband's closet once in a while. I made sure that plain shirts are separated from polo shirts and long sleeves shirts and that slacks are tucked neatly. Some clothes are bulky though like those Motorcycle jackets for men so you have to decide whether you want to fold them neatly or to hang them. If you have an ample space in your closet, hanging them would be a better option. Motorcycle apparel sometimes can be very expensive especially when it comes in a complete set so proper care and storage must be properly observed. Fixing your wardrobe space or closet is as important as choosing your wardrobe. You should be careful in choosing the clothes that you wear as this, most of the time defines your personality. We used to shop clothes from reputable stores, not necessarily branded but we make sure that they are of good quality. For those riding gear and accessories, I recommend BikeBandit.com. The only thing that puts us into limits sometimes, when it comes to our wardrobe space is the size of our room. However, if you are creative enough, you will be able to design this to accommodate all your stuff. There are lots of storage solutions for small spaces and you may find a lot of inspirations from the internet. You may even consider DIY if you are concerned about your budget. In my case, I even recycle and repurpose things around the house. Organizing my own wardrobe space has always been a challenge to me but I would say that it's also an enjoyable experience.